For many readers the songs of Indira included in this volume will bring the star-gazer's delighted excitement when a new planet swims into his ken the joy of discovery. The astrolabe of the mystery of God is Love, said jalaluddin Rumi. 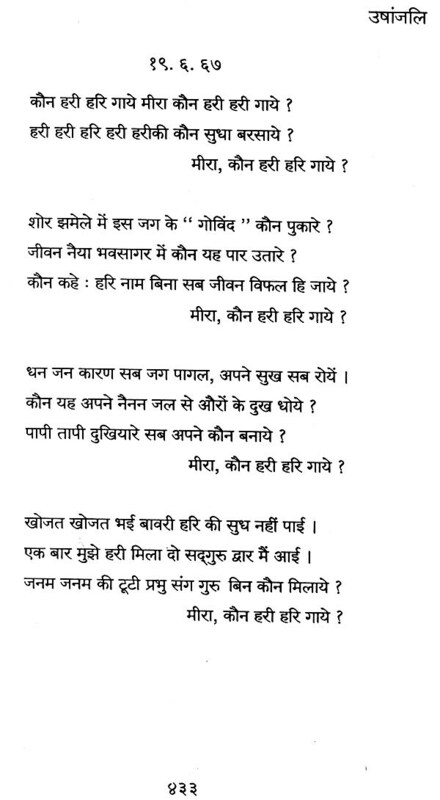 It is a love that survives time and conquers space, it is "a love of many lives, janama janama ki preeta purani." Memory lingers, waiting for the heaven-sent moment it wakens every time the psychic being opens or comes to the fore. 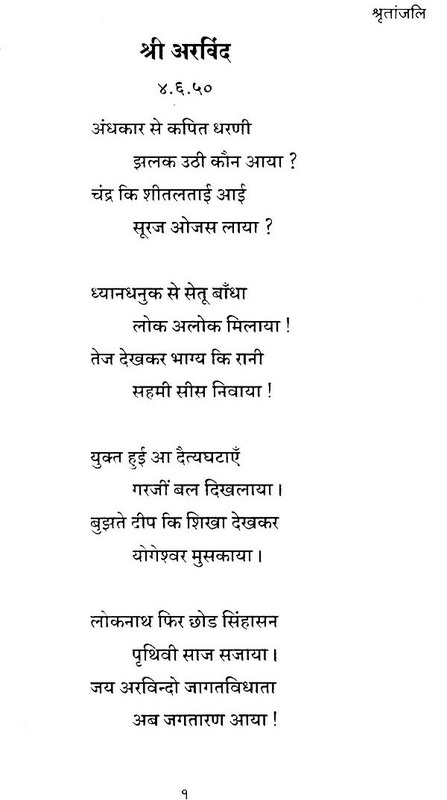 "Durlabha pave sharana Hariki khile jo bhagya kali - rare is the soul whose fate, in flower, is surrendered to Him alone." Here is that rare one. Reading this book we too become witnesses, at least for a while, of fate's happy flowering in a shower of golden songs. Fares Mira, the minstrel, singing His name! By all as gone mad for a phantom Flame! We are baffled - Kanhai alias Hari, is not only nithur ( the Heartless One) but chatur (cute) as well. But, fortunately, more than the amazement and the search for an explanation is the beauty of these songs which nothing can take away. To this let us submit ourselves whole heartedly and leave the textual and theological 'problems to the care of the wise. The purity, surrender, naturalness the intensity of their relevance and their unfailing wholeness are all part of an unforgettable experience, an exquisite education for the young soul. In these our "hostile times" the. Passion of Krishna comes like a music from another world to ours where most of us live like eternal exiles. Yet, something’s within us sleeps, remembers, waiting for the Call. How, under what circumstances, it will come, no man can say. But when it comes, you cannot, you must not, tarry - for Krishna can be relentless. "He IS a sufficiently trying deity." In these songs we see that that call has come. "Phir kisiki yad ayee ! - Again the memory has come, of Someone." It is the Radha-heart that knows Krishna, even during long hours of viraha ': "Dasha Radhaki na puchey kaho Mathurabasaiyasey - Tell the man of Mathura not to ask of Radha's state." 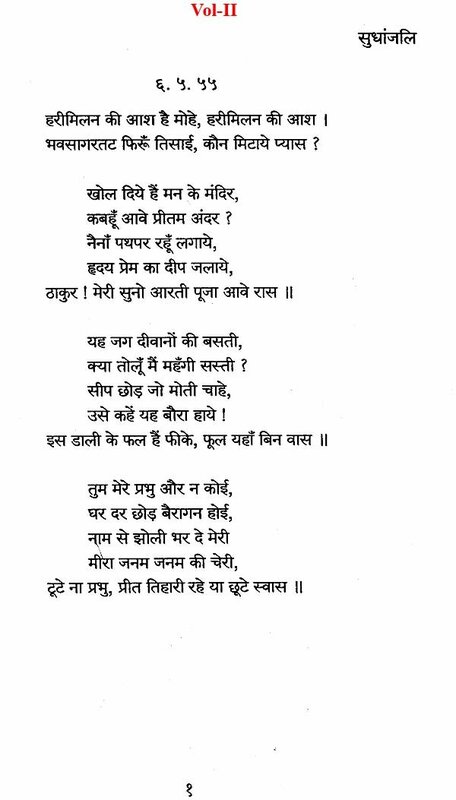 To have experience of Krishna is Radha's right of love, but to distill those ineffable moments of time, in poignant poems and superb songs, has been Indira's fate – ordained forte. 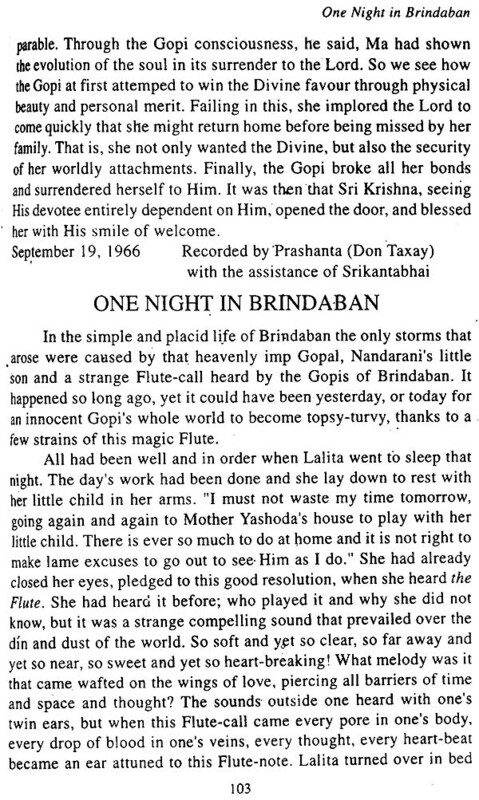 We are grateful to this channel - for she is too modest to claim authorship for all of these through which in this emancipated era can be heard, once again, Krishna's magic flute. Ambassadress from the psychic realms, she can well say: "Phir Miraki prem kahani suno ... sunaney ai.hum - Hark again to Mira's love lore I have come to sing!" The pure notes of her poetry creates an aura of significance that triumphs over all scepticism which, to quote what Sri Aurobindo said in a slightly different context, "cannot satisfy because, although its business was inquiry, it was unwilling sufficiently to inquire." For a while all jarring notes are subdued and we are wafted to some dim untrodden regions of the mind where the mystic marriage takes place; and, there opens to us, even to us, a "vision of the world as an instrument through which sounds the invitation to the meeting of bliss." As the haunting melody of these songs seeps into the depths of our being - we ask ourselves, echoing the poet, "Mathura kitni dur hai, rahi, Mathura kitnidur ? - How far is Mathura, O traveller, how far is Mathura? Such is its suggestive force that we have a feeling it cannot really be very far! 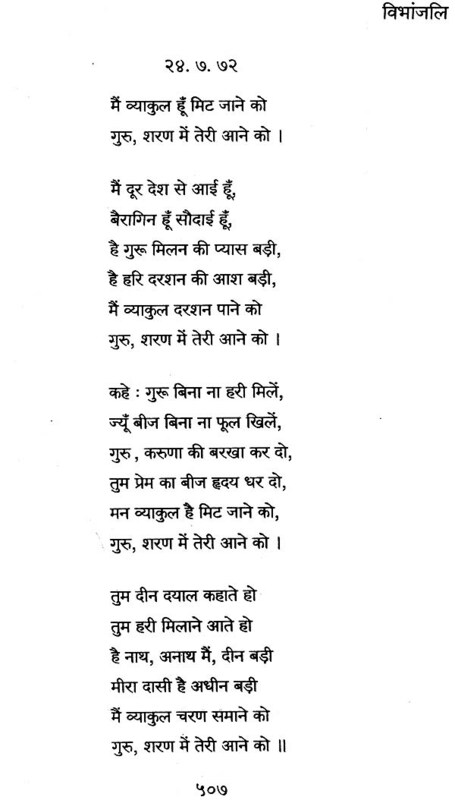 Those who have heard these songs rendered by Dilipkumar- as he alone knows how to do it - as well as those who will now read these for the first time, will join with me in thanking him for his 'discovery' of Indira and her for having, at last, agreed to their publication. As these songs begin to be heard in the inner ear, the mystery of the Ras unveils itself, little by little. For when we come to the heart of the matter, it is "nityalila, the eternal play of His endless Delight." Human personality is a profound and complex phenomenon. Time and time again its behaviour comes as a challenge to all known and accepted criteria of life and we look at it with wide-eyed wonder if not incredulity. The Yoga-Ashram of Sri Aurobindo with all that it stands for, spiritually, is - even apart from its spiritual outlook - very different from the normal life-movements of the world. No wonder many things, which appear abnormal and therefore unbelievable outside, are felt as normal and natural here. But what we are going to describe was, even for such an Ashram atmosphere, exceptional: the phenomenon seemed to be almost phenomenal! About three months ago a. Punjabi lady came here to our Ashram. We will call her by her Ashram name, Indira. She came first to the Ashram in February, 1949, and then again in July. When she returned to her home she started going into what is commonly called "the trance." But as the word means different things in different contexts, we shall use the Indian word Samadhi. 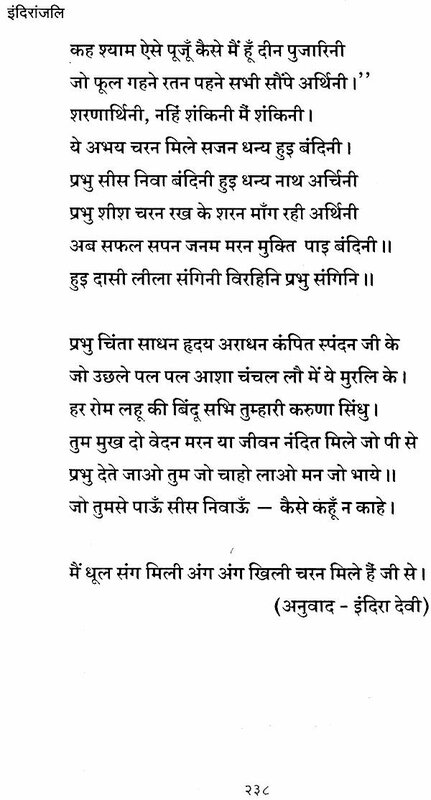 ( Sri Aurobindo wrote to Dilip Kumar last yeat that "her samadhi is of the savikalpa kind.") This happened mostly when Dilip Kumar sang bhajans, but it happened at other times as well and lasted longest, I am told, after midnight when she would, often enough, remain self-absorbed, sitting upright and immobile for hours. Once in Bombay last November, Dilip Kumar as well as many others saw her thus sitting for more than eight hours at a stretch. When he sings, the samadhi induced generally lasts for about an hour or two. An American visitor, Edward Fry, sent me last year an interesting description of this which I may well utilise here by way of introduction, the more so, as he has given a very graphic and faithful description of what happens at such times. "The most interesting thing I saw at Sri Aurobindo Ashram" he wrote, "was a girl, not for the usual reason because this was not a usual girl. Indira was physically an exotic-looking creature. She is millionaire. When I saw her around the Ashram I was interested, but one day soon I was to be fascinated. On that day I attended an Indian music programme given by the Ashram's famous musician and poet, Dilip Kumar Roy. "When I entered the room where the programme was to be given, I took a seat on the men's side. Just as the music started, Indira came in on the woman's side and seated herself, inconspicuously, back to the wall. She sat comfortably with her hands clasped around her knees and eyes closed. When Dilip's music began to warm up (religious songs with a wonderful subtle rhythm) she began to sway gently with the music. After about fifteen minutes she slowly and naturally assumed a perfect crosslegged yogic position. The swaying stopped and she got a very peaceful look on her face. I looked at her very frequently for the next hour and a half that the music continued, but never saw her move once. She was- absolutely motionless except for a slight easy breathing. "When the programme was over and the audience began to disperse, Indira sat motionlessly on. I lingered behind watching her until all the guests had left. Dilip came over to me and in response to my questions divulged a minimum of information. Indira had been going into trances like this for the past year, often induced by music or meditation. While in them she was oblivious to the outside world. Sri Aurobindo knew about them and called them belonging to the category of savikalpa samadhi. Frequently, in this state, she had visions and usually, just before awakening, she would get a beautiful smile on her face. Uninvited, I sat down to watch and wait. "In about half an hour she coughed once and began to move her head very slightly, Then she began to smile: almost imperceptibly at first, then slowly it grew into a full lovely smile with her eyes still closed. It was a smile no artist could paint, unperturbed and peaceful it seemed to have an inward quality, yet an outwardness bright enough to fill the room. "In the middle of my spell-bound observation, Dilip came back in the room and asked me to leave. He virtually had to use force but he modified it by saying that Indira would be embarrassed if she awoke and found anyone watching her. Most reluctantly I went down the stairs, only half - bolstered up by an invitation to tea that afternoon with her. "At tea, I found that Indira, like many Hindu girls, was a very bashful conversationalist. The situation was not 'helped by Dilip telling me, in her presence, how shy she was. We fumbled through cream-passing and biscuit-crunching till I finally hedged around to the solid subject of her background and today's trance. "The first bit of information that surprised me was that Dilip was her Guru - by her choice and Sri Aurobindo's and Mother's consent who are Dilip's Gurus, About a year ago Indira was on her deathbed. doctors had given her up and she was actually gasping. 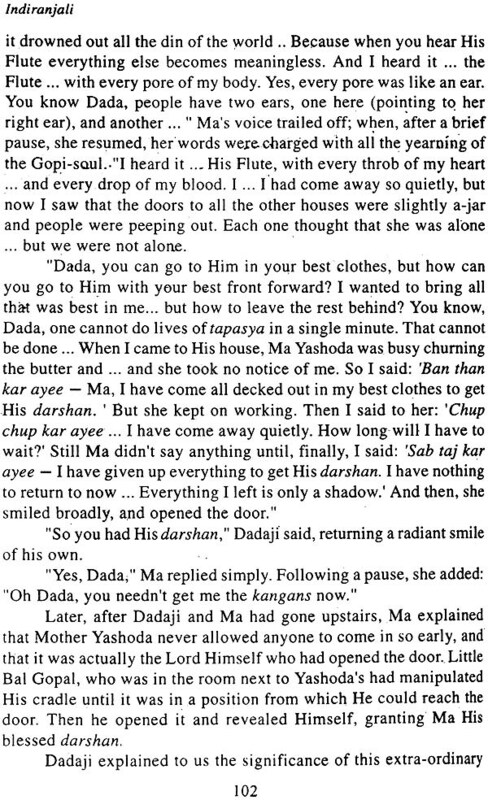 Dilip went there and had written to Sri Aurobindo to save her. He wrote back that divine intervention was expected. She recovered-and everybody concerned attributed it to Sri Aurobindo. During this' illness she had an intuitive feeling of the death of a close friend which soon after proved correct. "When I asked her about today's trance she replied. after a long pause. that she saw Sri Aurobindo come and put his hand .on Di lip's head. "After we finished tea, Dilip had to leave to do some work. Indira then became a little more communicative. She told me about her eldest son of ten years of age who is quite remarkable and reads the Gita daily and performs Puja, prayer etc. and I told her about my father and mother. "She was very modest about her own spiritual experiences. Further. she modestly stated that it had all been a gift to her. She had not worked for it and even now meditated infrequently arid then not for any desire for development but' because it was difficult not to meditate. Now she meditates only for ten or fifteen minutes about twice a day, usually with Dilip. "Her manner had a: humble and childlike quality to it. When I asked what sort of Yoga she followed; she said, she did nothing but follow her Guru's advice and keep God upper most in her thoughts. Though she is still far from well she eats practically nothing - only a-few cups of tea, a slice of bread and a bowl of soup per day. "Her one complaint was that people would continually barge up and ask her about her spiritual experiences which she couldn't possibly answer. She also said that she felt friendly vibrations with some people. "The last night I was in Pondicherry, Dilip gave another music programme. I went and was not surprised, shortly after the programme started, to see Indira quietly get up and leave the room. When the music came to an end I again lingered behind. Dilip knew why I had stayed on and without a word went into the next room and switched on the light. There, on the floor against the wall, was Indira sitting perfectly erect in her Buddha like yoga-position, peaceful and motionless with her eyes closed. Such a saintly expression was on her face that it defies-description - a feeling, not a look, a blessing just to see. OM PEACE OM !" During the time her trance lasted, while she would stay utterly lost to outer consciousness, she never became unconscious herself since, on coming to, she would give a full account of all that she had seen and experienced the while, not the least interesting feature of which was her vivid encounters with Mira Bai whom she saw - day after marvellous day and large and indubitable as life - now singing, now talking, now explaining to her spiritual mysteries in similes and images - in short, discussing things with her as a friend to friend, sometimes even defending her own viewpoint against hers. And last, though not least, Indira gave a detailed. description of •Mira's garments, ornaments down to little dainty moles on her neck and palm and lovely dimples that showed when she smiled - almost like a fairy story . !.As days-passed, this relationship between the two developed till something happened which was even more surprising Mira actually started telling her beautiful parables which took many of us by storm, as it were. Some of these are given in this book as they may help the reader to appreciate the reality of Mira's inspiration better. But to come back to her songs. There can be little doubt that the songs which have been heard by Indira ( marked with asterisks in the index) are different in style from the rest which she has composed in her normal consciousness And their distinction lies in this that the atmosphere, or rather the stimmung they conjure up, is not modern and does seem consonant with the character and personality of Mira even when their metres and language sound a little different from the Mira-bhajans which are extant. 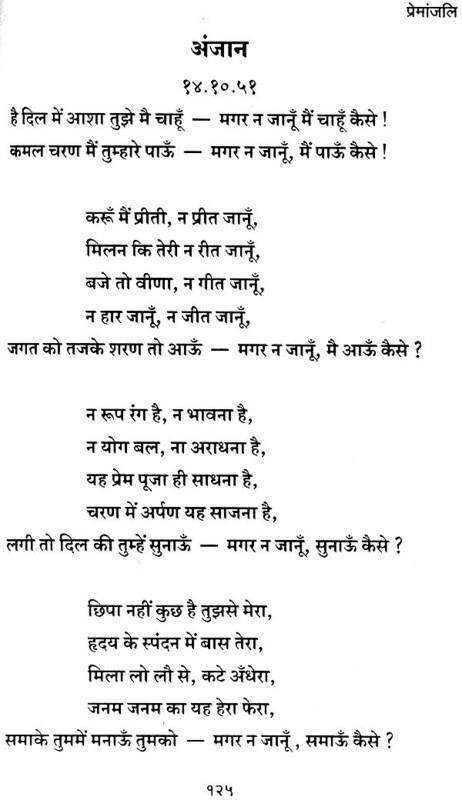 In fact, as Mira once actually told Indira, somewhat cryptically, that the songs she sang to her were as much Indira's as her own. This seems to us to be more revealing than cryptic. 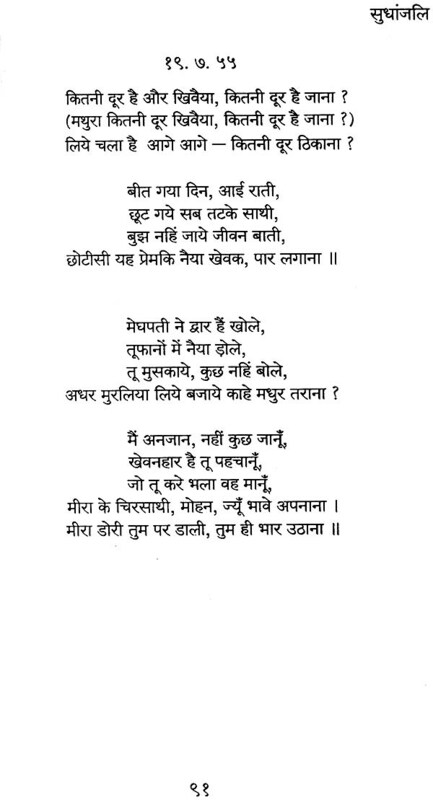 For although it is true that something of Indira's own personality and way of feeling does get imported into these songs, it is equally true that in most of these songs (sung by Mira and registered by Indira) something else too finds admission which can have nothing to do with her present self. 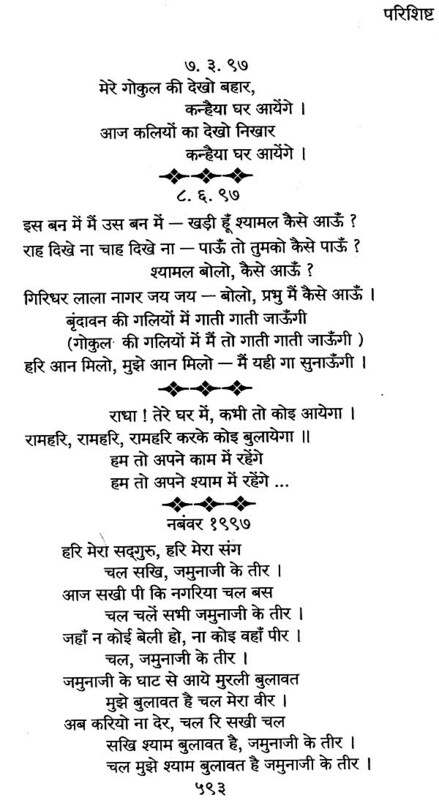 One reason is this time and again has she dictated to Dilip (who took them down after her samadhi when she could not possibly hold a pencil) whole songs without a pause and songs which contained as often as not, a word or two here and there which she could not understand but which were perfectly correct in their place. Indira Devi's Shrutanjali was printed in Sri Aurobindo Ashram in 1951 and Premanjali in Calcutta in 1953. 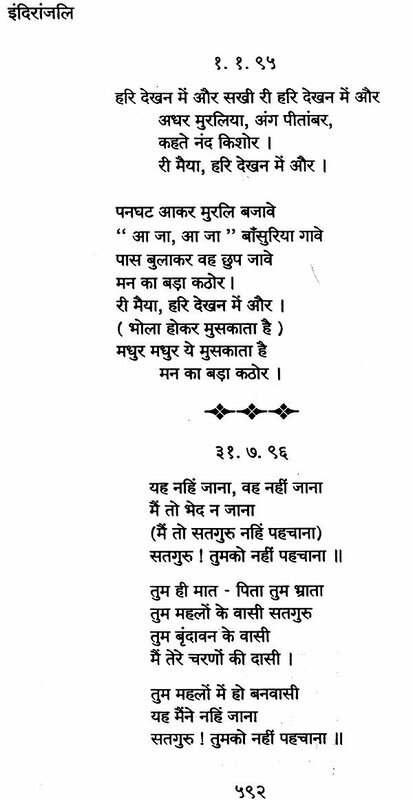 In the present edition I have selected her best songs from these two books along with the Foreword and Prefaces and have omitted the translations in order to make it more compact as a purely Hindi book of verses. At the end I have given a number of her new (unpublished) songs as well as a few Urdu songs of hers which she composed on her own, presumably. 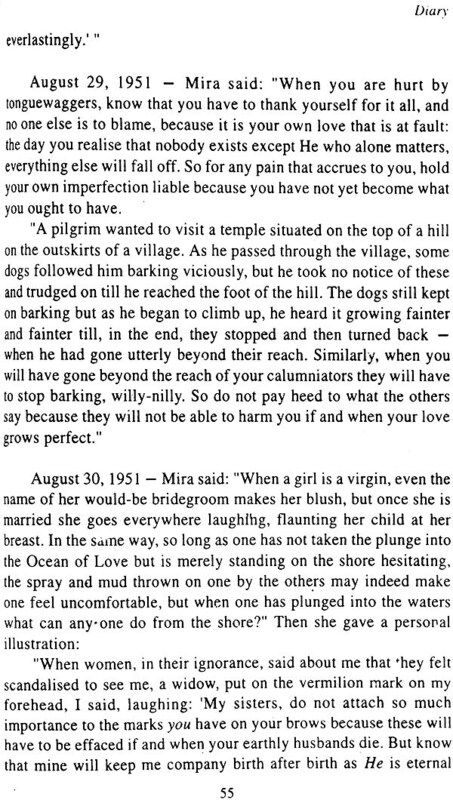 There are a few more parables of Mira which I propose to publish later on. A few are given in our book: THE FLUTE CALLS STILL. 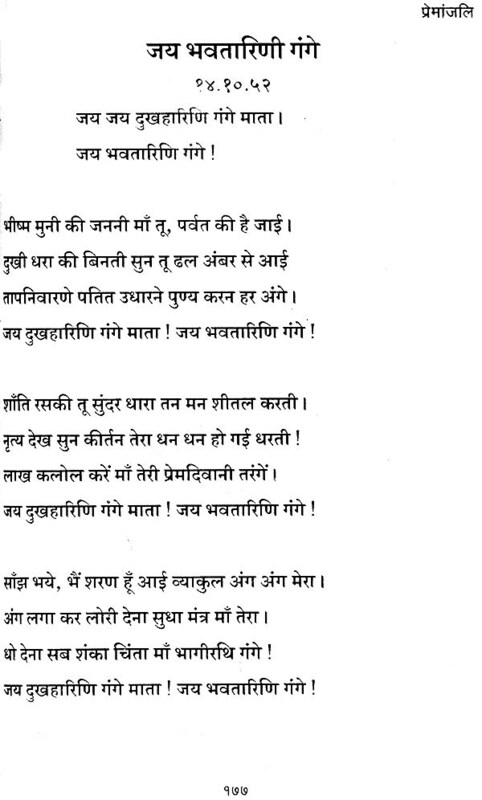 ( TO THE FIRST EDITION) As the two previous volumes of Indira Devi's devotional songs entitled, Shrutanjali and Premanjali have been acclaimed by hundreds of devotees and discerning critics, I feel happy to present a third volume of her soulful poems. These, I trust, will be as welcome to her readers, and especially, to those who have seen her dance ecstatically to some of these songs to the accompaniment of my singing. The last eight songs have been accorded a place here as they derive, essentially from a spiritual inspiration even though their message is patriotic. 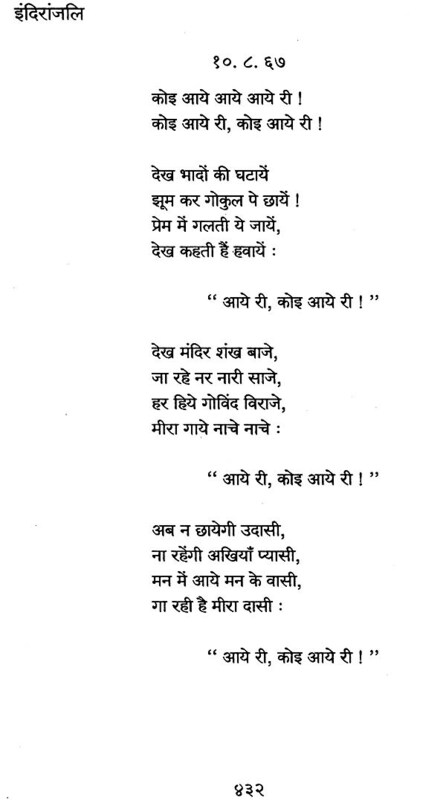 Of these, three were translated by her in 1950, from the original Bengali songs composed by Bengal's famous poet and dramatist, Dwijendralal Roy, sixty years ago. 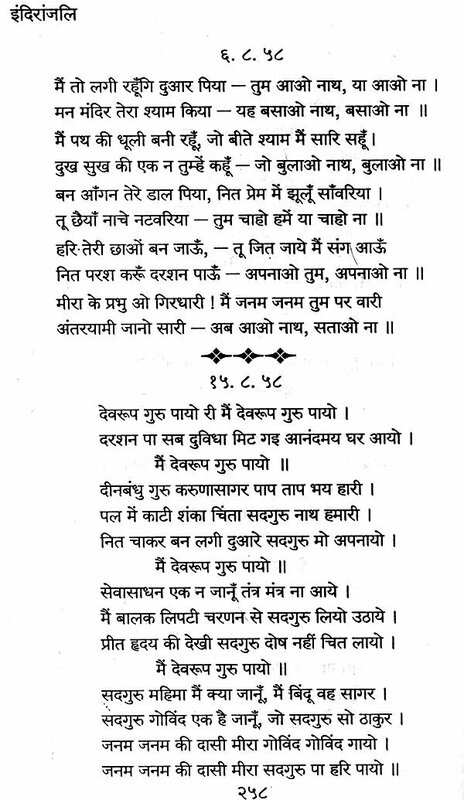 The hymn to Ganga (p.159) is rendered from his famous Bengali songs which Pandit Madan Mohan Malaviya was wont to ask me to sing to him whenever we met. (And every time I sang it he used to say, his eyes glistening with unshed tears: "Every Hindu should know this hymn by heart.") 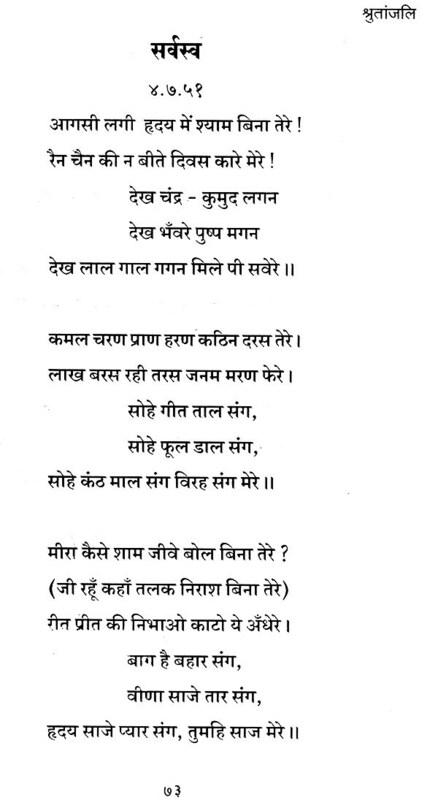 These four songs were first published in Shrutanjali. 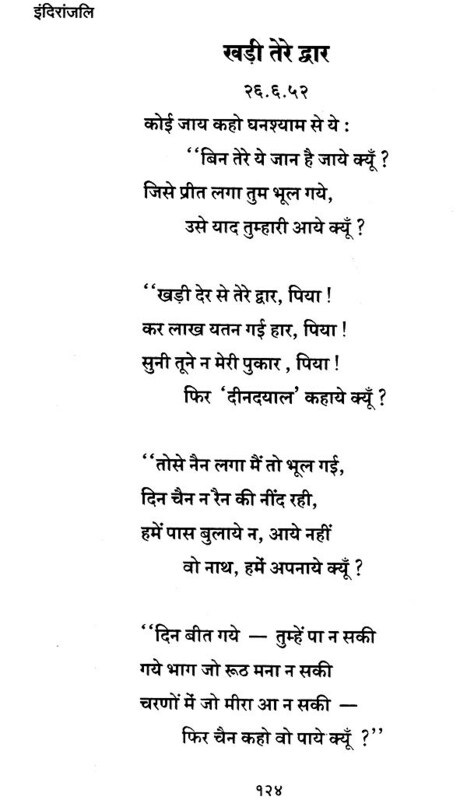 The song on page 165 has been translated by my daughter disciple from a Bengali song of mine and can be sung in the tune of La Marseillaise. At the end I have appended a sheaf of her songs translated into English (as well as a few beautiful poems she wrote in English.) These are intended primarily for her appreciative friends in the West. 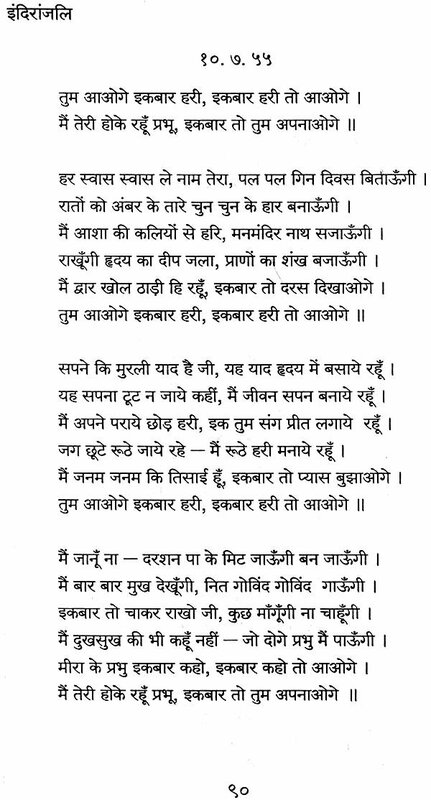 Mahamahopadhyaya Shri Gopinath Kaviraj, revered by thousands in India, has put us under a deep debt by writing for Sudhanjali a luminous Foreword whose beauty and profundity will, doubtless, be appreciated by all who are moved by the appraisement of a man of God endowed with true real erudition. 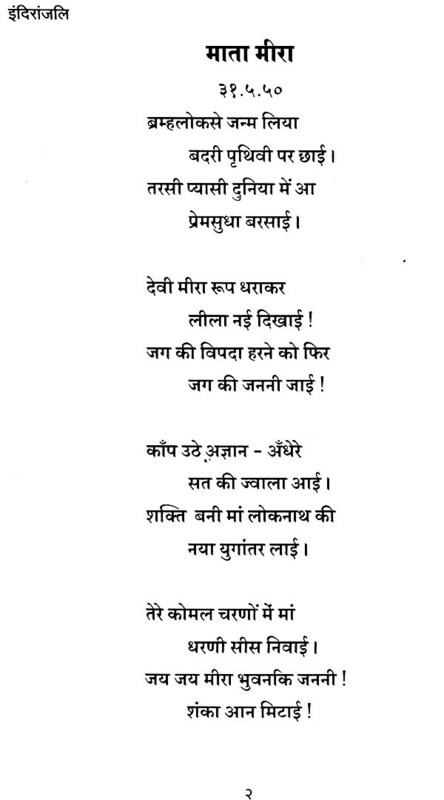 Shrimati Soma Talwar of Kanpur has put us under a debt by translating Shri Gopinath's Foreword into Hindi and Shri Aina helped in typing out the translations. We thank also our dear sister, Shrimati Savitri Khanna, Shri Varma and Pandit Pandharinath Mukunda Dangre of Maharashtra Rashtrabhasha Prachar Samiti, Poona, for having so lovingly helped us in revising the spelling and punctuation of these bhajans. Last, but not the least, we thank dear and energetic brother, M. J. Shahani for having helped us in ever so many ways. 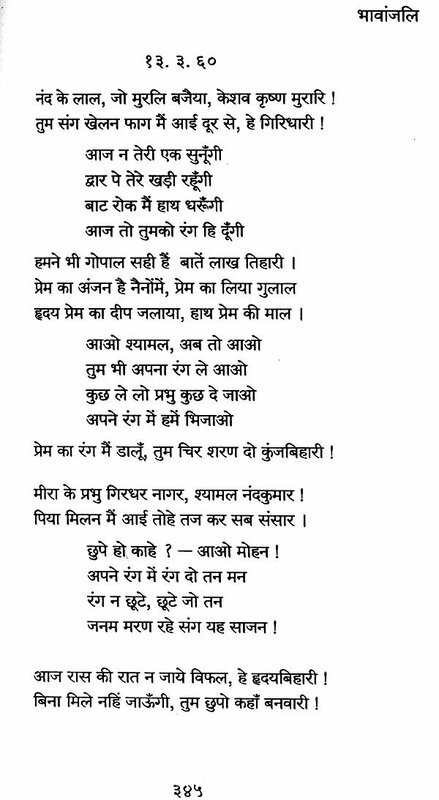 A few years ago - in April, 1952, to be precise - Dilip Kumar sent me Shrutanjali, a sheaf of sweet and euphonious songs in Hindi. 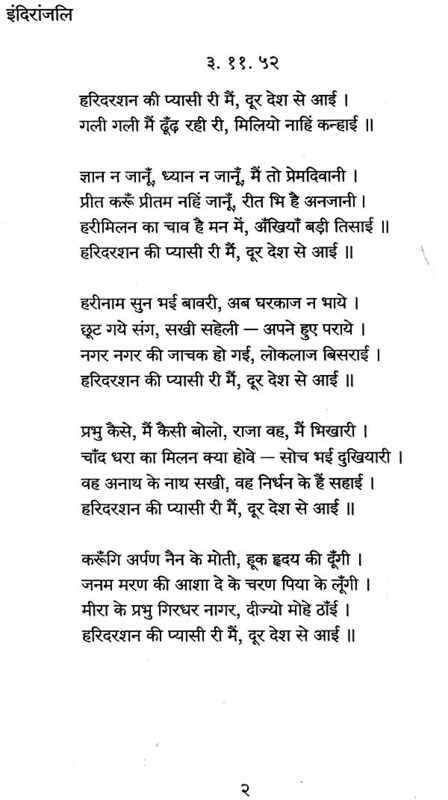 A few of these were composed by his daughter - disciple, Indira Devi. The rest, and the majority, she dictated from memory, transcribing what she had heard in her samadhi when Mirabai came to her and sang them. The two types have, indeed, traits of similarity but are not quite identical in style. 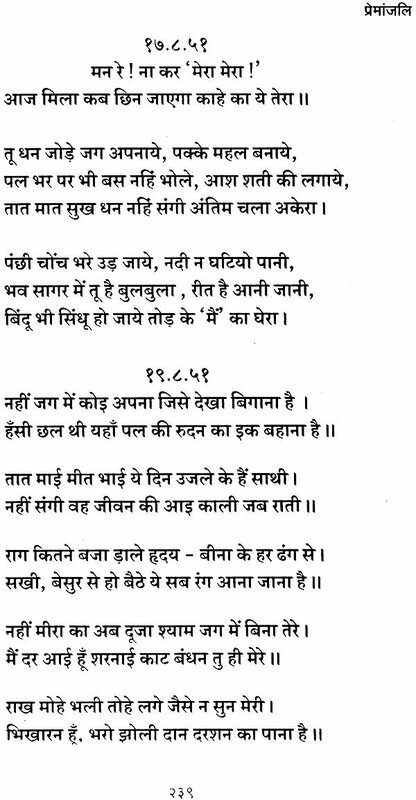 Such living poems permeated with the essence of devotion (bhaktirasa) are rarely to be met with, expressing beautifully in a simple and lucid language the heart's profound emotion and one-pointed yearning for the Lord. The divine love He manifested through His Brindaban lila has out flowed through these in a purling stream conveying a variety of moods rendering the ecstasy of mystic love. 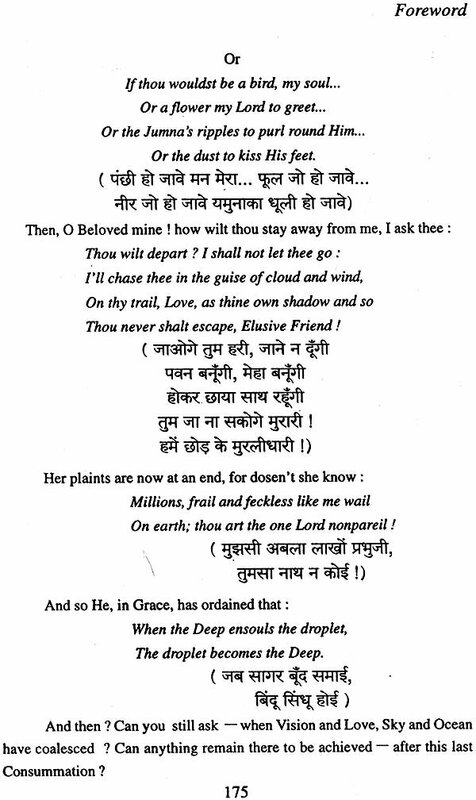 As the influence of Mira and the God - love inspired by her came more and more to dominate Indira's life, a second series of remarkable songs similarly composed, accrued and were duly published, a couple of years later, in a collection entitled, Premanjali, which derived, I felt, from a still deeper inspiration. 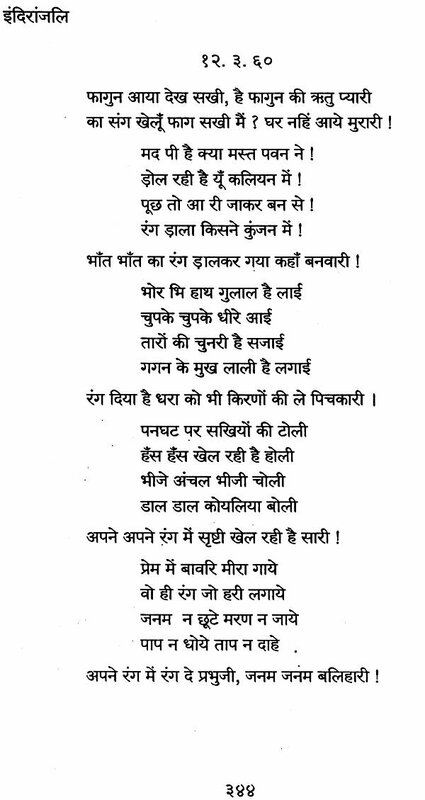 In the realm of Hindi love -lyrics dealing with devotion, Shrutanjali together with Premanjali constitutes a veritable gift with a charm all its own. 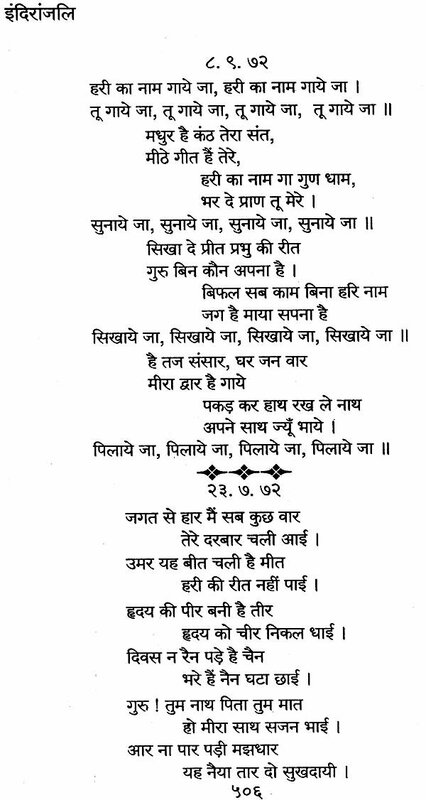 Now comes her third sheaf of songs, Sudhanjali, wherein we find the distinction and sweetness of its predecessors duly maintained, with something superadded: a further enrichment from the point of view of variety of savours and flavours (rasa). 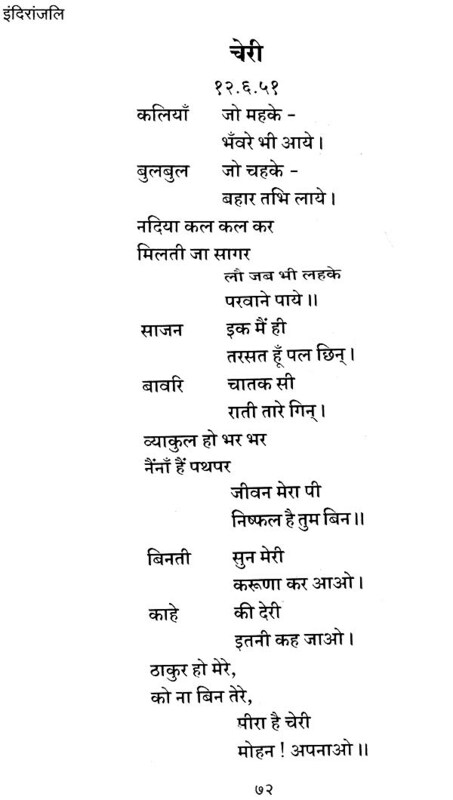 Although Indira's songs reflect various moods of God-love, all portrayed luminously, their dominant theme is the anguish of separation from the Beloved, viraha, with all its poignant sweetness. This, as everyone knows, is the one refrain of Mira's old songs - the songs that are still extant - as well as of those of the other mystic ministrels who have sung heartchurningly of viraha. In the domain of the soul's evolution the yearning of viraha stands, as it were, at the summit. Love cannot obtain its sustenance save through the stimulus of viraha. 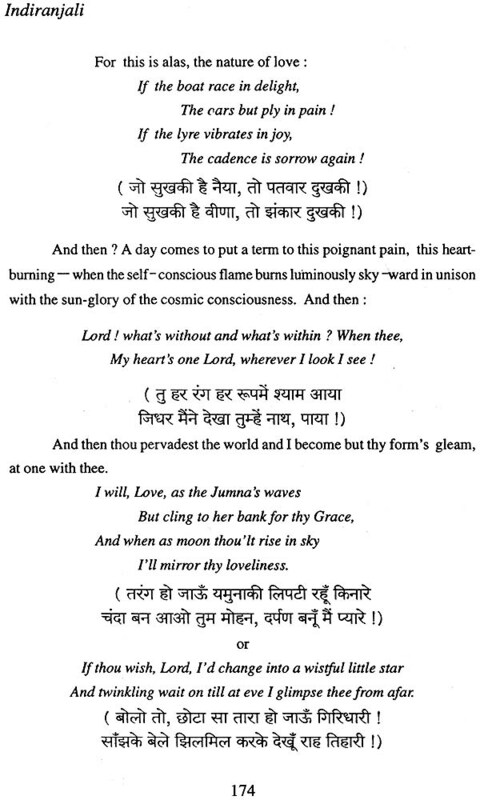 Indeed, viraha may well be looked upon as the quintessence of love. The supreme bliss and glory of union, milan, have for their basis the unwept tears of viraha. No wonder viraha is apotheosized as of the essence of love because without its nourishment love could not evolve. Not the soul alone, but the spirit, too, has its Dark Night to be traversed. Radha, the love-mad, is no figment of the poet's fancy. It is true that there is milan after viraha, but it is equally true that milan cannot put a term, once and for all, to viraha which keeps its vigil in the heart of milan. In other words, viraha must succeed milan every time a new yearning succeeds a phase of fulfilment. Were it not so, the deeper milan with its attendant enrichment, could not trail, as it does, in the wake of viraha, thus maintaining the perennial novelty of its savour. What is viraha? A sense of void stemming from unslaked longing: on one side, we have the void (abhava), on the other, simultaneous sense of fulfilment (bhava). The reason is that no sooner the yearning reaches its acme of intensity, than the hiatus that stands between - of space and time and what not- is annihilated leading to attainment (prapti). With every attainment the aspirant's receptivity grows, where after the soul cries out once again: "I want more, indeed, still more l" As a result, the attainment fails to retain its native status and a new quest begins. How put a term to the Termless? In the infinite lila of love one meets with a new attainment with each new approach : one attains and yet feels as though one has failed to attain, one sees and yet feels as though one has not seen enough and the pilgrimage to the Infinite continues everlastingly. A new savour accrues at every bend: the infinite delight (rasa) has infinite lilts, so the journey knows no end. And yet there is an end to everything - every time and every where, for how can motion survive in the Eternal Poise - in equilibrium, ever-still, imperturbable tranquil ? Nonetheless, motion too is a reality wherefore the centre of every milan is ever-resonant with the melody of viraha : the lila of the Infinite comes floating, un impeded, into each finite entity. The drop in the Deep and the Deep in the drop both are true - at one and the same time. Therefore, just as the pain of viraha lurks at the heart of milan, even so, the anguish of viraha blossoms as the eternal bliss of Mahamilan, the Last Mergence. At the point of this final dissolution in the Timeless the drop and the Deep become, indeed, one; but in the lila in the Time a gulf still persists which, even when bridged, seems unbridgeable. In other words, at every clasp of milan, even when a part of the hiatus is spanned, a part of it still survives which never comes to an end in endless Time. Indeed, the attainment (prapti ) does come, but only to be overtaken by the void (abhava) once more so the quest can start over again. Fulfilment and frustration (bhava and abhava) are, indeed, both equally indispensable to the continuation of the Play. This is the marvellous glory of Mahabhava, the Identity in time: even when one attains, the longing for attainment remains unfulfilled; even when one sees, the thirst for seeing stays unslaked. Neverthless, through viraha also the Yoga (contact) may still be perpetuated and this marvellous Yoga is rendered possible by the dynamics of the will. But for this, my will and His must both cooperate. When He withdraws His Will, the Yoga cannot come about, no more than when I decline to will it, personally. The will of either is indispensable, though not conflict, because surrender can only happen when it is voluntary. In the last analysis, however, surrender involves not the renunciation of the personal will but only its transformation. My will then becomes one with His-which is the Yoga. If my will were erased at the outset, this Yoga could not be established and there would only be His relationless Poise (sthiti). When, however, surrender is achieved, my personal will cannot exist as a separate entity : for then His Will becomes mine and I can only want what He wants, so when pain comes I must accept it as His Will, nay, even rejoice to accept everything that comes from Him. This is the Yoga experienced in viraha even in milan : Mira is the Yogini of this Yoga. 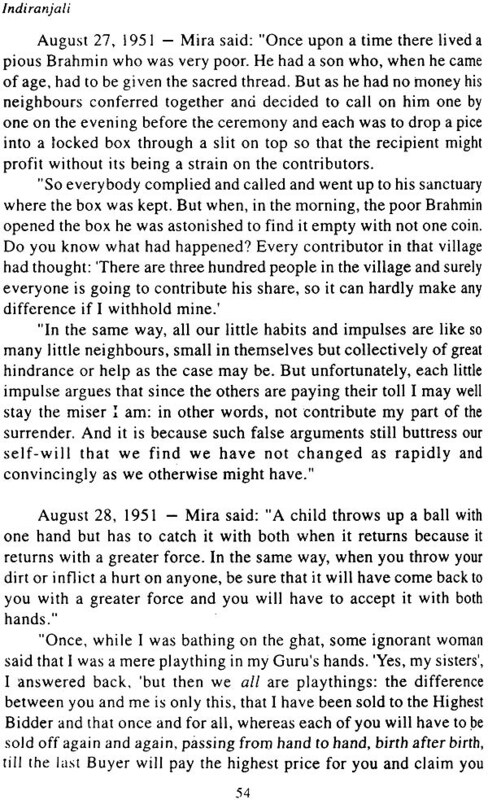 From Mira's own testimony we gather that Indira is her intimate friend and comrade pilgrim on the Eternal Pilgrimage. Indira has yet to realise this but Mira is fully alive to it, being fully conscious of having attained the Haven. One can get an inkling of this mystic secret from the extraordinary authority she wields over Indira. 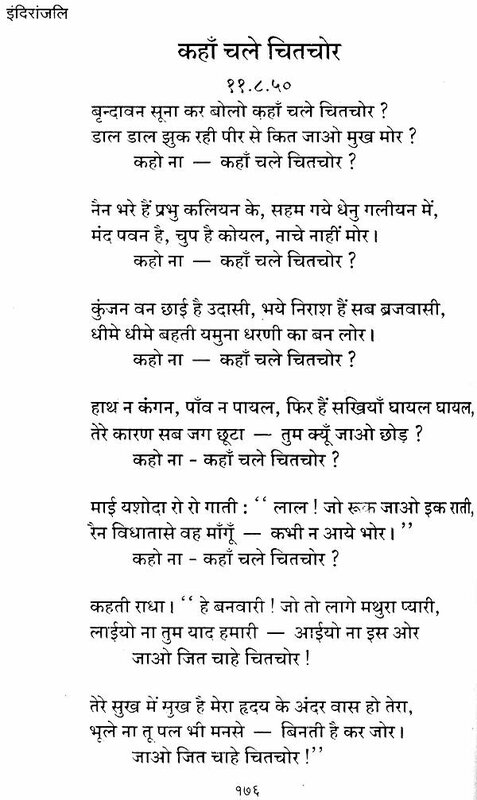 Some people may question - as an incredible miracle - the phenomenon of Mira's appearing before Indira to sing to her and lead her "day after marvellous day." But I am persuaded that here- there is no valid reason for scepticism. Men are acquainted with the sense-world, the perceptible world of fact. But none who know will dare deny that this material world is profoundly pervaded by and interlocked with a super-sensuous and immaculate world radiant with the light of a supernal Consciousness (atindriya, Chidalokjjvala, suddhasattvamaya rojya ). But till one acquires the inwardgazing vision (antarmukhi drishti) one must seek in vain for a clue to this supraphysical world and its laws and data. One is reminded, incidentally, of Saint Teresa. Once, while she was living cloistered in a Toledo Convent, Mother Mary of the Angels called on her to deliver an important message. St. Teresa was at the time writing her famous book, Interior Castle. Engrossed in her work, she had just started in a fresh page when the visitor called. But no sooner had she taken off her spectacles in order to receive the message than she went off into a samadhi and stayed in it, self-absorbed, for several hours. Mother Mary, overawed, did not leave the room but waited on, looking at St. Teresa fixedly. When at last the latter came to, the blank page was found filled, from top to bottom, with written lines. Realising that an outsider had come to surprise her secret, St. Teresa hastily thrust the sheet away into a box. It is also reported that a nun, named Mother Anne of the Incarnation, was once passing before St. Teresa's cell when she caught a glimpse of her face. She stopped amazed: St. Teresa's face was illuminated with an intense light as she went on writing rapidly without pausing once to revise or correct what came'! After about an hour, at midnight, she finished, when 10, the miraculous light on her face vanished ! Thereafter, St. Teresa kneeled and prayed for full three hours before going to bed. Such authoritative accounts, duly authenticated, are on record in the mystic literature of various countries. I have myself some personal experience of phenomena such as these. So I am persuaded, I repeat, that there is no rational justification for discrediting Mira's coming to Indira in person, singing to her and leading her day by day.